Having lived in Marrakesh, and several other cities overseas, I have depended on CNN International, not only as a news source, but also as a gateway into culture all around the world. In particular, have always loved their feature shows, like Inside Africa and Inside the Middle East. And as far as personal role models go, reporter and anchor Hala Gorani tops my list of everything desirable in a woman - intrepid, smart, compassionate and beautiful. 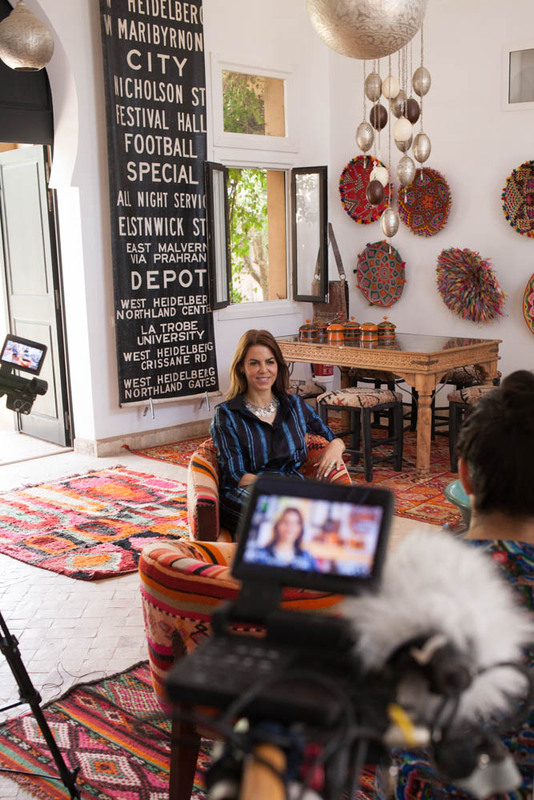 So it was such a thrill for me last July to work with CNN on a CNNGo Marrakech episode. It was ridiculously fun being on air explaining Marrakech from a hot air balloon, taking viewers shopping in the Moroccan souks, and talking about the magic (and sheer craziness) of the snake charmers on the Jemma el Fnaa Square. I am very excited to be giving it another whirl, this time on the show, African Voices. I'll be featured in an upcoming episode as one of three designers in Africa. 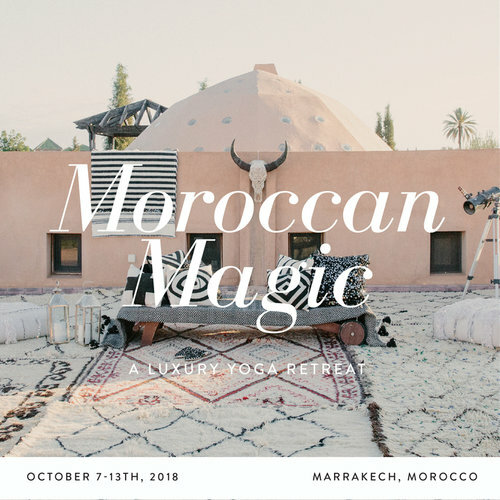 I will be talking about my creative process, sharing items that I've designed in the M.Montague Souk and then taking viewers into Marrakech to show them my inspirations -- including all the beautiful visuals of this chaotic and amazing city I now call home. Here are some quick pics from my day with CNN. 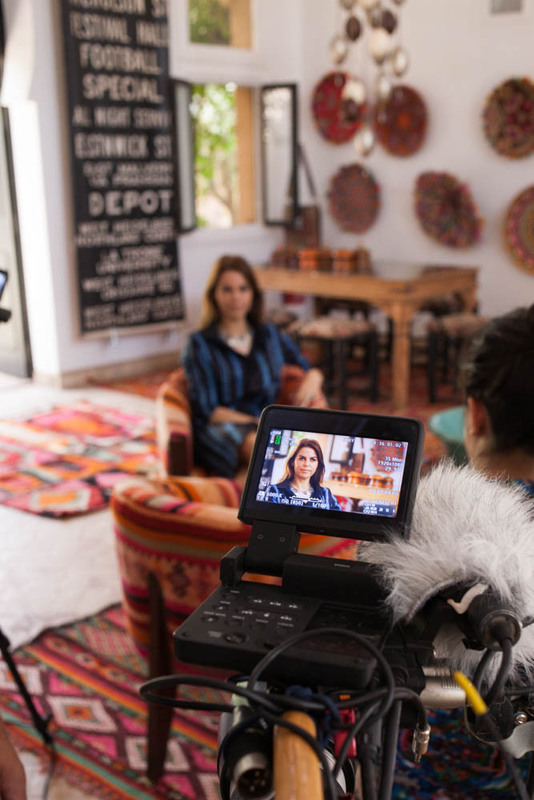 This episode of African Voices will air in July! I'll keep you posted. So very happy to see my house at Peacock Pavilions in the pages of one of my favorite British design magazines, Living Etc. I wanted to share a few shots with you. I did these very pretty stairs in collaboration with Melanie Royals and the Peacock Painters. And I stenciled the door myself! You can buy the stencils right here. My great room at Peacock Pavilions with its beautiful octagonal dome with peep holes (thanks to my talented architect husband, Chris Redecke) . I designed the lanterns myself. You can find similar Beni Ouarain carpets in my Red Thread Souk. The enormous advertising banner is Spanish and was purchased several years ago. I have a second identical one that I horded because I love it so much (makes a huge, cool impact). It is $925. Contact me (moroccanmaryamATyahooDOTcom) if you would like to make it yours. Breakfast nook in my kitchen. I designed the pillows in vinyl, to make cleanups super easy. The floor tiles are from Popham Design. My office where I write this blog! The floors were done with a custom Modello and tell a little tale that I wrote. My husband and I built the shelves, and I stenciled my file folder boxes. I handmixed the paint color for the walls. Pick up a copy of the current Living Etc. to see all the images, including the floorplans of our house! 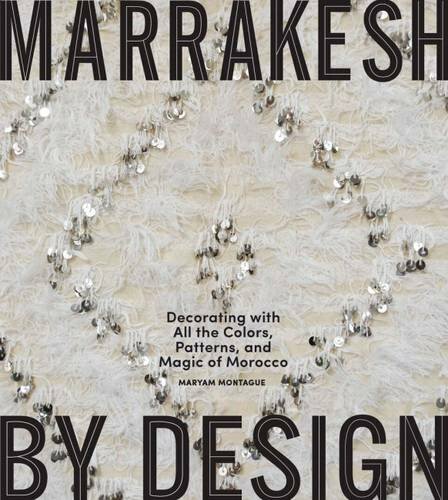 If you would like to see more pics of our house (and many more Moroccan houses), puruse by book, Marrakesh by Design. Photography by the amazing Richard Powers. Many thanks to Tiffany Burch Nichols for scanning the photos and sending them along. Note: Subscribe to My Marrakesh here. Follow My Marrakesh on Twitter here. Let's be friends on Facebook here. Ah Lovelies, it's Valentine's Day. Could there be a better reason for making things pretty? I think not. I set our table in the Peacock Pavilions dining tent, in honor of the special occasion, with objects culled from around the house. A vintage sculpture study in porcelain. Faceted vases made from Moet & Chandon containers. Branches from our own Moroccan olive grove. Porcelain leaves commissioned from Caroline Douglas. Vintage German glove molds in porcelain. Large vintage birds with long swishy tails and old Swedish Dirigold dessert spoons. Happy Valentine's Day:-) Here's hoping you're spending it with someone you love. PS The Instant Love photography retreat is at our place and I set this table just for them! If you're a fan of Polaroid photography, their book is a must!